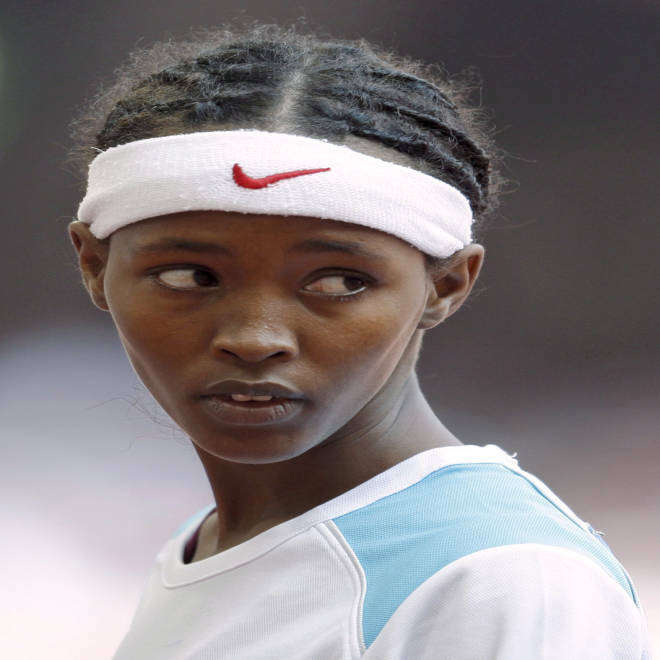 Somalian athlete Samia Yusuf Omar at at the Beijing 2008 Olympic Games. A woman from war-torn Somalia who rose to fame by running in the 200 meters at the Beijing Olympics drowned while trying to reach Europe ahead of the London 2012 Games, it has emerged. Samia Yusuf Omar died when a boat carrying migrants from Libya to Italy sank in April, according to a report in Italian by the Pubblico blog and other Italian media. The BBC said the Italian media reports suggest Omar may have been hoping to find a coach in Europe who could help her reach the London Olympics. Somali track and field legend Abdi Bile, who was world champion in the 1500 meters in 1987, was quoted as comparing Omar’s fate with that of Somali-born British runner Mo Farah, who won two Olympic gold medals at the London Games. "We are happy for Mo -- he is our pride," he said, according to Pubblico. "But we will not forget Samia." There were few details about what happened to Omar, but BBC News said Somalia’s National Olympic Committee had confirmed she had died. NBC News was unable to reach the committee on the phone number listed on its website and an email was not immediately returned. Italy's Coast Guard rescues 80 migrants from an overcrowded boat stranded just off the coast of the southern island of Lampedusa. NBCNews.com's Dara Brown reports. There were tributes to Omar from across the world on the comments section of a YouTube video of her race in Beijing. “Love,﻿ hope and peace from Barcelona Samia. Your still alive in ours hearts. RIP,” one user, frankiee78, said. “Brave is the one who never give up ... Even being the last one on this heat, Samia was proud of being there for her country. Every time when a shooting star will shows in a Somalian sky, it will be Samia the one who is going to be running for﻿ her country.... RIP from Columbus, OH,” MrEmilito74 said. There were messages from people in the United States, Serbia, Mexico, Portugal, Uruguay and other countries. With wife's conviction, what is next for China's Bo Xilai?